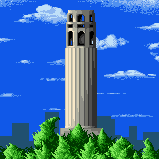 Coit Tower is a tower in San Francisco that is said to resemble a fire hose. It only appears in the NES and SNES releases of Mario is Missing! as one of the landmarks that Luigi has to visit in the city. In the DOS and Deluxe versions, Alcatraz and the Cable Car appear in its place. The Tower's Window is stolen, causing the Tower to shut down, and Luigi's task is to find and return it. Once he obtains it, he is required to prove that it is legitimate, which he does by answering the questions below. Afterwards, the Coit Tower is repoened. On what hill does Coit Tower stand? What was the Tower built to honor? Coit tower[sic] stands 500 feet above the San Francisco Bay on top of Telegraph Hill. The structure takes its name from Lillian Hitchcock Coit who donated $125,000 to have it built in 1934. The tower honors the San Francisco Fire Brigade. Shaped like a tall column, it is easy to see why people constantly remark that it resembles a fire hose. Inside, the tower is decorated with sixteen large murals. The 25 mural artists were commissioned as part of the 'make work' program designed to ease financial hardships during the Great Depression. This page was last edited on November 11, 2018, at 20:26.